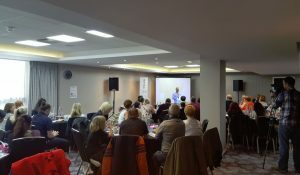 100 patients, families and professionals came together on Saturday 1st July to discuss the latest developments in X-Linked Hypophosphatemia at a special event hosted by Climb in collaboration with Central Manchester Healthcare Trust. XLH – X-Linked Hypophosphatemia – is a genetic disorder that affects about one in 20,000 people. Typically, it is passed from one generation to the next, but sometimes appears in an individual with no family history of XLH. The unique and exciting event, featured talks by specialists and patients, including Professor Zulf Mughal, Professor Nick Shaw, Professor Peter Selby, Dr Kay Hood, Tahir Khanand Dr Raja Padidela, as well as the opportunity to network with other families. Feedback from the day was extremely positive with lots of connections made between families, sharing personal experiences and exchanging contact details. The day was filmed, videos and slides will be available to view soon.